Usability has been identified as a key discipline responsible for the success of a product. I was fascinated by the potential of UX as a discipline and decided to get dedicated work experience in this field to be able to further my knowledge in this field. I worked with a number of UX methodologies in field studies and compiled a number of UX reports that outlined my research findings. The research included deriving Persona identification using empathy maps at workshops, through to on the field interviews to understand customer pain points, creating a customer journey across various touch points which identified points along the journey where the customer experience could be substantially improved. Most of the user research was immensely useful when mapped against existing products and services using a customer value canvas. As part of developing improved services and cutting the costs of support for electricity companies, I conceptualised how a bot could radically bring down the costs for one of the highest calls at retail electricity companies. I identified individual steps and points for friction for an existing customer as it existed and an alternative customer journey using a Bot. 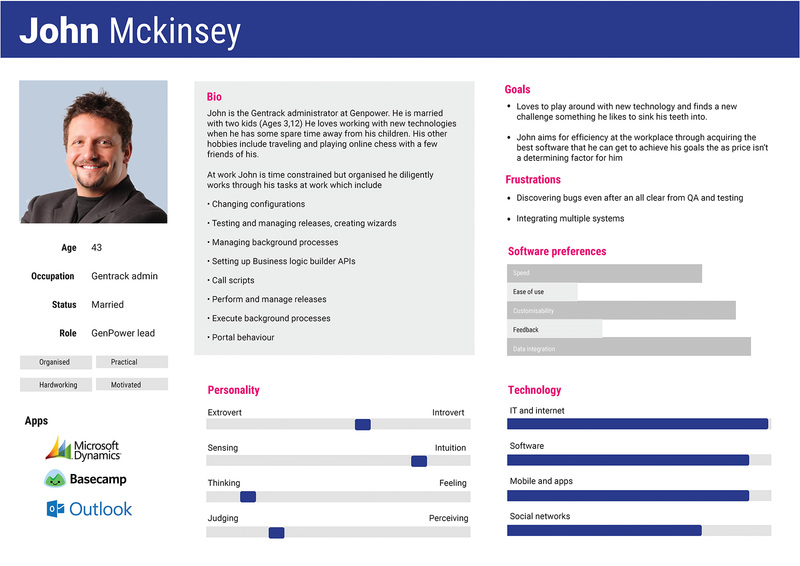 Well researched personas are one of the best references for any work on product design. Depending on the product a persona could either include their daily schedule or a Myer Briggs scale. I usually began creating proto-personas that were derived through interviewing relevant stakeholders or at workshops using empathy mapping tools. These yielded quick and effective results, especially where interviewing actual users was not a viable option. Personas evolved constantly as new information became available and where stronger evidence of behavioural patterns overruled previous assumptions. Mediaworks: Researching our archetypes from our demographics at 3 News and Radio Live which was a more niche audience. These personas had daily schedules to see how we could fit into their lives. 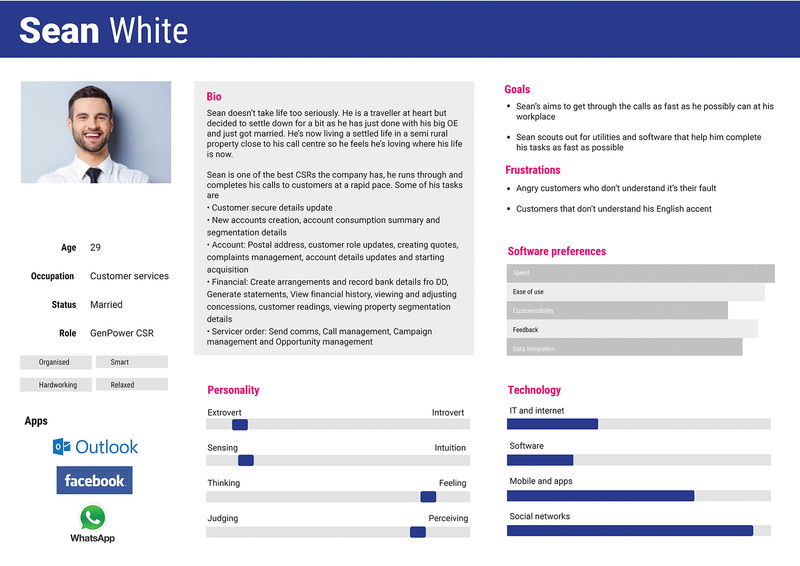 For our early strategy sessions we had basic persona types defined which we used to understand our target demographics. This gave us a good starting point from where to head with our content and design. Putti apps: As our user base grew, we had to identify and create positive persona archetypes as well as negative persona archetypes. This allowed to concentrate and focus on who was our target personas while eliminating the ones that we didn’t want to focus on so we could create a better-defined product for the few personas we cared about. Once these persona types were identified I helped gather more evidence about their pain points, jobs to be done and frustrations through multiple UX methodologies including interviews, surveys, customer feedback and immersion. Once identified, I wrote and printed the persona types and brought them into every design team meeting and stuck them on the wall. The effect of this was huge. It instantly realigned the focus of design discussions from thinking micro to macro and how the initiative would help our target personas. Gentrack: Part of the research involved visiting client sites and immersing myself in an actual working environment. Each persona represented software users and each persona used a completely different subset of features within the software. This led to ideation of how the software could be specialised and customised for each persona. Creating personas opened up a whole slew of ideas for future product development. Because each persona type had a distinct role with distinct tasks it opened the possibility of optimising the platform to create apps that were a subset of the main platform with tasks that were specialised for a persona type. The hypothesis was that would get users trained faster and would improve their productivity substantially. Personas also allowed us to identify influencers who were responsible for technology purchase versus passive users that had no influence on the software that was used. Usability testing always yielded some of the best insights for product improvement. The testing involved defining objectives for the testing, putting together a number of tasks, recording the tasks while interviewing the users as they went along completing the tasks. The results were compiled and reviewed against quantitative data to eliminate false positives and put together as a report for improvement to be made to the final product. Mediaworks: Usability testing of the 3 News and the Radio Live website before launch by inviting a select number of actual users and giving them tasks to complete and interviewing them while completion of their tasks. The results of the testing resulted in making big usability improvements to the products before launch. Putti apps: Usability testing was conducted on the on boarding journey to get an understanding of how easy it was to onboard new users and build their own apps. The usability studies were recorded and the result of the interviews was tallied to make big usability improvements to the product. Gentrack: Before releasing the new version of the software to retailers I conducted usability testing at sites that did a comparison of how the new version tracked against the old version of the software by tracking its performance across various metrics. I setup a test group of users and put together usability testing using tasks specialised for those roles. The usability tests were recorded using Camptasia. I tracked the recording of these tasks and output a number of performance metrics like time to complete the task, mouse clicks, scrolling amount, errors and ease of use. The results were put together into a report that outlined how each version of the software compared to each other over different tasks.